THIS CLASS IS SOLD OUT AND REGISTRATION IS CLOSED. THANK YOU FOR YOUR INTEREST. 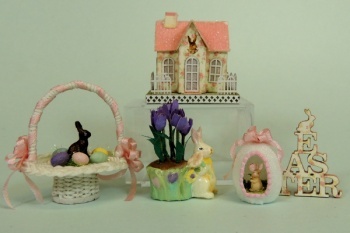 This is an easy and fun class that will teach you several new skills and give you 5 new pieces to decorate your dollhouse for easter, or to use to make a small vignette. 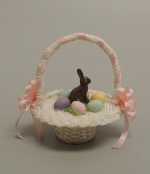 To begin with, learn to make a beautiful white wicker basket just like the one I had as a child, beautifully shaped and trimmed with silk ribbon bows, Fill it with the traditional chocolate bunny and pretty pastel eggs and you have a basket that even the Easter bunny would envy. 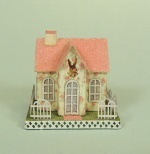 Next, we have a simply darling little Easter glitter house. This is the most delicate house I have done yet, and I just LOVE it, with it's pretty rose printed walls, glittered pink roof, lattice work base and arched fence. It is all laser cut and scored, so it is easy to assemble, and looks just soooo sweet! Next, learn to make paper tulips and then arrange them in a beautiful 3d printed planter that is new this year. My original had a watercolor looking paint job and so does this little one. I think it is as cute as can be. Next, we have a beautiful sugar egg. You have a choice of sizes for this particular piece. The egg is available in either 1" tall or 3/4" tall size. It is 3D printed, and the piped icing is part of the printed design. Inside, is a darling little bunny. 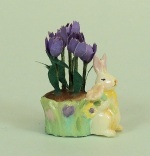 I must tell you that the bunny that goes inside the 3/4" size egg is pretty small to paint, which is why I am also offering the 1" size, for those who are not sure about working super small. The eggs are glittered, grassed, beribboned, and are as pretty as can be. The last piece is a pretty wooden cut sign that also features a tiny rose print pattern that coordinates with all of the other pieces. BE SURE TO CHOOSE THE SIZE PANORAMIC SUGAR EGG YOU WANT USING THE DROP DOWN MENU! These kits will ship April 6, so this will be a short registration. 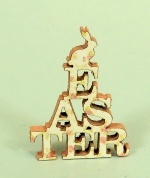 I want to make sure you have time to get these things put together in time for Easter! Be sure to check out the photos below!